We couldn’t have done it without you! It has been an amazing year getting to open our own dental practice and meet all of our amazing patients and community members. Having been in Southern California for about 10 years now, we have never experienced the warmth and kindness we have in our Orange County community. Opening and owning your own business is a huge task (as we’ve learned), but the reward from our line of work is one of the most rewarding experiences anyone could ever have at a job. Our patients welcomed us with open arms and open hearts when Dr. Jorgenson took over the practice last July. We were eager to meet everyone and also to show our patients a different dental experience than they may have had in the past. Dr. Jorgenson has a pretty simple philosophy when it comes to dentistry and patient care. He always ensures that our staff is prepared for the patient’s visit as best as possible before they arrive and goes to extra lengths to accommodate any special requests our patients might have (like no cold water, wants to listen to 90s pop music only, is nervous and needs extra TLC, etc.). When patients are in our office, they are our number one priority. You will be greeted by our front office staff and get settled in by one of our Registered Dental Assistants Jayme, Rose, or Brittany. Our Registered Dental Hygienist Lisa Thurm will then conduct an oral cancer screening and a thorough hygiene exam. Then you get to meet the wonderful and compassionate, Dr. Jeremy Jorgenson, who will conduct his comprehensive exam and give you an honest diagnosis of your current dental health. That is the really important part to us: being honest and conservative to save patient’s tooth structure and wallets. It sounds simple, because it is. When you are in an environment where the staff and doctors really care about you, your family, and overall well-being, you can trust that your health is our priority. Another philosophy of Dr. Jorgenson’s and Advance Dental Care is to give back what you’ve been given. You don’t just live and work in a community, you serve it and cultivate it. Our community events are part of a program we call ADC Cares. We started last August and by giving free school supplies to all patients and this year added donating 1% of each sale to the Newport Mesa Unified School District and donating school supplies to a local charity called Chavas Angels in Santa Ana. In October, we bought back Halloween candy from kids at $1/Lb. and donated it to the troops overseas through a charity called #OperationGratitude. In November, we held a food drive in our office and at Mother’s Market in Costa Mesa for the Second Harvest Food Bank. December was all about collecting gifts for Toys For Tots. We also participated in several other community events outside the office. Dr. Jorgenson lost a grandmother to Alzheimer’s disease two years ago and his grandfather to heart disease last year. 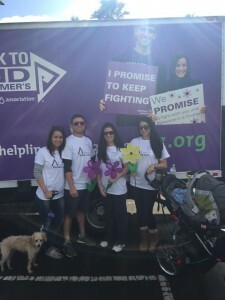 Team ADC walked in the Huntington Beach #ENDALZ walk last November, and the American Heart Association’s Heart Walk at Angeles Stadium this past March. 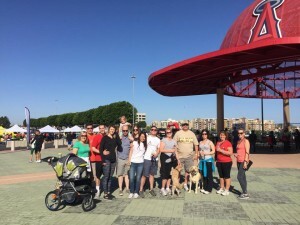 We can’t forget the Costa Mesa Community Run this past April where our team mascot Doodle out ran all of us! Special shout out to our friends at the Costa Mesa Chamber of Commerce for their support in all of our community and office events. To celebrate our success and to pay forward our blessings, every patient who visits our office in the month of September will get to draw a envelope that contains a special reward to say THANK YOU! Each person has the chance to win 10% Off Any Service, 10% Off Any Cosmetic Service, Free Whitening Trays, $1000 Off Invisalign or MTM Treamtent, and even cash prizes as well! The celebration culminates in a One Year Anniversary Party at our office on September 23rd, 2015 from 5:00-8:00pm located at 3033 Bristol St. Ste. AA, Costa Mesa, CA 92626. We’ll have food, drinks, music, other local businesses, and chances to win more prizes! You could even win a 32″ Samsung flat screen TV! We hope you’ll join us for the festivities and to allow us to personally thank you for you support! Here’s to another amazing year and the twenty amazing years after that! Cheers! 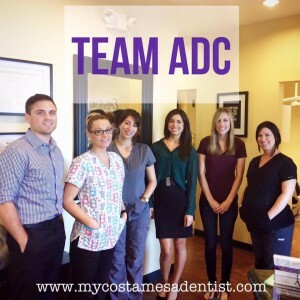 Dr. Jeremy B. Jorgenson and the Advanced Dental Care Staff are truly so appreciative for your support. To find out more about the specials this month and to RSVP to the One Year Anniversary party, please like our Facebook page at www.facebook.com/mycostamesadds. If you would like to schedule your appointment now, please call (714) 424-9099 or click on the “Book Appointment Now” button on the top of this page to schedule your appointment online.